NOTE: If you've ever wondered how the "Speed Ratings" on tires translate into MPH, kaltires.com has a handy chart or you can geek out with TireRack.com's more than you ever wanted to know write-up on the history of tire ratings. This morning I was speculating an estimated payment for my next dream car. The best way to get a reasonable idea? Spec out my *other* dream car! The Build Your Own MINI experience is in ongoing development and expansion. Actual prices and available options are subject to change and may vary from the Summary listing. Please contact us with any questions. We welcome your comments. *Total MSRP excludes all taxes, title/documentary fees, registration, tags, MINI preparation charges, MINI Dealer installed options, insurance, certificate of compliance or non-compliance fees, and finance charges. Prices may vary by MINI Dealership. **All prices are suggested retail prices and are subject to change. 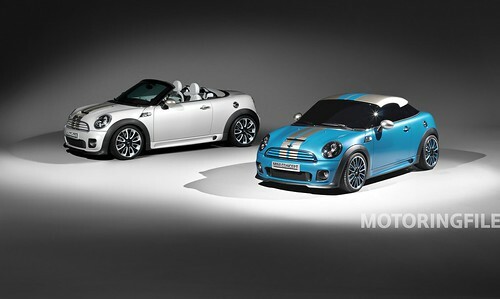 Actual prices may vary and depend upon MINI Dealer. Prices do not include installation or painting, if required. Prices exclude taxes and/or shipping and handling charges. Check with your authorized MINI Dealer for complete accuracy of information and availability. All the illustrations and specifications contained in this web site are based on the latest product information available at the time of posting. MINI, a division of BMW of North America, LLC. reserves the right to make changes at any time, without notice, in colors, materials, and equipment. Today's MotoringFile article implies that the Roadster and Coupe should be available sometime in 2011. I anticipate one to teeter on the $41k mark the way I would want it equipped. Since I definitely intend to purchase one, if I wanted to pay cash in full, I'll have to sock away about $2,200 a month starting now! For the sake of math, I spec'd out a topped out 2010 JCW Clubman at $42,595. To get a payment in a reasonable amount of around $600, I'm looking at a $10,000 down payment! That's only around $500 a month I'll need to shove under the mattress, post haste! EEK!! Note- this is the third time I'm mentioning that this image NSFW. (in other words, a random naked MINI Babe. And Soap. And a MINI. Enjoy.) (not your style? Try this. When I got the email today from today's honored guest, little did he know that I am already keenly aware of the products and services they provide to the MINI community. Namely, custom graphics! If you didn't already know, MINI Motoring Graphics is the company of choice used by several U.S. MINI dealers including some of MINIUSA's previous special promotions. You can upload your own images to their website, tweak them here and there, and they'll make vinyl graphics for you to put on your MINI- talk about the ultimate in you-i-fi-cation! I work at minimotoringgraphics.com and I stumbled across your MINI blog and have just been out and about trying to touch base with MINI owners and lovers and enthusiasts and people in community regarding what we do and who we are. We are the only offical parter for MINI USA and run their Graphics program. I don't know if you've ever seen the website or heard of us. We've been around for about two years and we just relaunched the website a few weeks ago. It's amazing how far we've come but we still have a long way to go and I'm leading the charge with trying to spread the word, word of mouth, on the internet ect. All the dealerships can order from us and I am working hard to get the clubs and website owners to work with us as well so we can get the MINI ONLINE community some really sweet discounts. I car pool to work every morning and when i see a MINI I see so much potential and want to help get people an amazing product to dress up their MINI. New technology that we have invented to allow people full personalization of their MINI. It's never been possible before to do what we are doing and MINI is the only car that currently has this kind of technology we have made. *Totally made up the part about the hat. I get nothing for this. As a MINI owner I am still in empathetic shock. First seen on Blue Meeny's "Cooper Cuties", Google traced this photo to its photographer, Chris Selby. I like to give credit where credit is due, so feel free to check his Flickr account for more awesome photos. Plus, I Loooooove this dress!!! Another photo first seen at BlueMeeny 's "Cooper Cuties" collection. I found this photo over at BlueMeeny 's "Cooper Cuties" collection. (and you thought it was just me. *blush*). Show him (or her) some love and tell him (or her) Bushfinger sent cha! He (or she) has some great photos of lovely ladies and Minis that I will likely be stealing "highlighting" here in "Random MINI Babes" over the next few weeks. I can't read Chinese but I think the caption says, "Why yes, this is an awesome Cabrio". Apparently Twilight Saga New Moon teen idol Kristen Stewart drives a Black Cooper S. (With body matched fenders and Anthracite Interior, in case you were wondering). Although I don't really know who Kristen Stewart is, I hear this "Twilight" thing is all the rage with the youngsters, so I include it for shameless web traffic purposes. And yeah, she's kinda cute too!